Yesterday, we had to make The Decision about our cat, Lacey. It was one of those if-this-comes-back-again choices, and it did and very obviously. Which only makes The Decision the tiniest bit easier and doesn’t help the day at all. I debated whether to blog about Lace or not. It always feels a little weird to put stuff like this out on social media. On the other hand, I know I don’t think it’s weird at all when other people do it. And then again, you know, for some of us, feelings take form in our minds as words, and then the words want to go somewhere. And then that helps. So…yeah. Blogging. I’ve had a lot of cats. My parents were both veterinarians and had their own vet practice, and we pretty much always had three or four cats at any time, most of which had “found” us or been left at the clinic and brought home. When I met my husband, his cat adopted me, which was pretty awesome since Fred was known for his crankiness and not-high-love for most humans. Most, if not every single one, of the cats I’ve known have been pretty awesome in one way or another. And then came Lacey. She discovered us by wandering into our yard one day when my son was about five. My husband told Ian that if he sat “really still,” the cat would probably come over to him. Which she did. And she never left. The vet thought she was about seven at the time. I never did figure out what her first years were like or where she might have come from, because she was clean, well-fed, and totally relaxed and friendly. This was not a cat who had been mistreated and run away and not a cat who someone had dumped, I was pretty sure. A wanderer, I thought. Except she never wandered again. My son is now 17. Which, if the vet’s calculation was anywhere near correct, made Lacey about 19. It was no wonder things were shutting down. Lacey was that magic combination of cat, both smart and sweet. If you know cats, you know that’s not all that common a mix. Sometimes the smart ones are cranky, and the sweet ones are, well…not the brightest bulbs on the tree. She had it all. She was a hunter, too–when she was younger she brought a cottontail bunny into the house (rescued by us, and a little helpful factoid for you: 409 does clean up rabbit pee!) and a baby bat (apparently they sometimes do their training flights during the day). She would meow in the middle of the night for my husband to come and play with the mouse she’d caught. I know, some people don’t like the hunting aspects of felines, and I’m not crazy about the corpses myself, but you have to admire that kind of talent and determination. For the past few years, Lacey had definitely been a senior cat. She slept a lot, but was always there for TV time, waking up as we sat down and repositioning herself on a lap–she pretty much divided herself between my husband and son evenly. And this was the best thing about Lacey. There are dog people and there are cat people. I’m kind of a mix–I don’t want the care of a dog, but I will stop you on the street to have a little meet-and-greet with your dog, even if you’re in a hurry. And I don’t think I could live in a house that didn’t have a cat, because, hey–they really do add so much personality to the family mix. And, you know…fuzziness. But I know a complete cat person when I see them, and my husband and son fall solidly and heavily on that side of the line. My son doesn’t really remember Fred, who died when he was about three. But Lacey…I’m not sure Ian remembers not having Lacey. She has been the cat that either made him a cat person or, more likely, found the cat person already inside him and just merged with it. Just like I know that my son will always be reading and will always be building things and will always be playing music, I know that my son will always have a cat in his life. Sure, yes, there will be gaps–not sure most dorms allow felines, and life takes a bit of time to settle into and make the home that has the space for a pet, but he will find that place and he will find a feline to step into it. And take over. And while I think he would have gotten there on his own or with some other cat, I also know that Lacey has made this certain. She was a gift for Ian, for all of us, that–if I’d specifically gone out and looked for, I doubt I could have found. She came herself, and she changed our lives. I have always known that, yes, pets are part of a family, that they make a family, but–as many times as I’ve gone through this process before–that fact has never felt so true. We will miss you, Lace. So very, very much. He will, Kelly. But the nice thing is that he’ll know to fill it as much as he can with more kitties. Wonderful tribute, and hold those sweet Lacey memories close. Tears here, too. “My heart has joined The Thousand — my friend stopped running today.” (Watership Down) Hugs and understanding from a definite cat person. I haven’t had a cat for many, many years due to apartment living, but I still know all it means to have a Lacey in one’s life. Oh, I do remember that quote. Beautiful. Thank you, Beth. 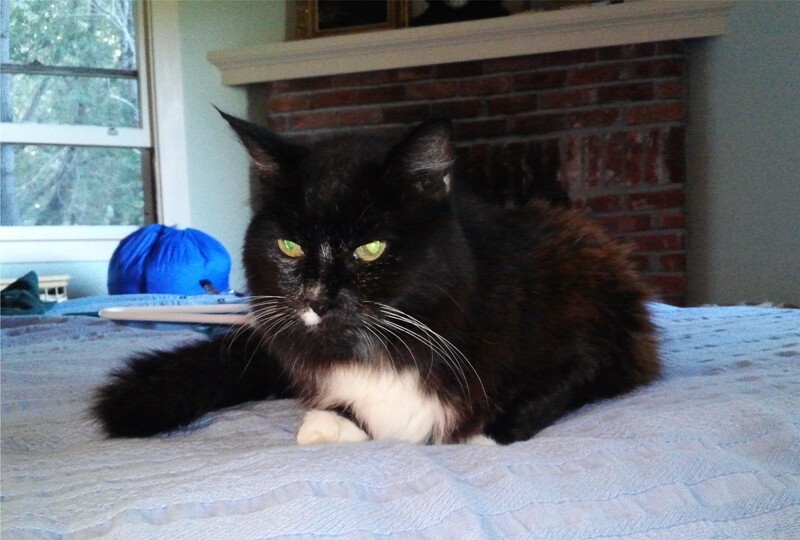 So sorry Lacey is gone – but what a wonderful cat she was! This made me tear up. 😦 Oh I’m so sorry for your loss. I was never a cat person until my own kitties came into my life and I know I will never stop being a cat person now. Hugs from me! Nutschell, they do work their way into your heart! Thanks. I’m glad, too. Give Bleu a hug back for me! And I’ve never seen someone articulate so well why people have pets, and what they give us. Thanks, Jenn! Working for my parents, I got to understand how I felt about it, but also see an awful lot of people go through the living and the dying part. Pets are SO huge. Such a beautiful tribute, but I’m so sorry, Becky! I lost the cat who made me forever a cat person when I was 26, and I still miss her. I miss all the cats I have. This loss feels just a little stronger, but I think that’s probably partially how great Lacey was and how much I connect her with my son. I lost my sweet “old lady” cat three years ago, so I hope you can believe me when I say I can feel your pain. My mom says that the best gift you can give your pet is to help them in this particular way because they simply can’t make the decision themself. Thankfully, the bad memories of “that day” will fade and you will only call up the happier ones. I had many of my cat’s photos printed onto a coffee mug, so I can hold her in my hand every day!